Eugene Custer Baum passed away on June 17, 2015 at his home in Santa Barbara with his wife beside him. Gene had suffered from prostate and metastatic bone cancer without remission for over a decade. His limitations were complicated by the effects of Parkinson’s disease and cardiovascular disease. Gene was born on August 8, 1941 in San Francisco to astrophysicist parents, Custer Charles Baum and Persis Eugenia Fell Baum, who preceded him in death. He was ordained as a Catholic priest in 1967 after graduating from Our Lady Queen of Angels and St. John’s Seminary. After ministering four years at St. Joseph’s Parish in Carpinteria, Gene left active ministry and taught religion and algebra at St. Thomas Aquinas High School in San Bernardino where he met his beloved wife, Sandra Ruth Johnson, who taught biology and math and later became a registered nurse. Gene will always be remembered for his warm, compassionate, non-judgmental manner, intelligence, humor and sharp wit as exemplified by his April Fools’ Day proposal to Sandra in 1972. Gene remained in Highland, raising their two daughters, and later earned an MFT license and a PhD degree in psychology. He provided clinical care and supervision at the Child and Adolescent Treatment Services (CATS) Clinic, Department of Behavioral Health, County of San Bernardino. After his daughters went to college, he concluded his career as Director for Children’s Services, Alcohol, Drug and Mental Health Services, County of Santa Barbara, retiring in August, 2003. Gene’s deep concern for helping others was modeled in all his actions. He lived his faith daily by serving others in many kind and gentle ways. His passion most of his life was orchids and grew about a thousand plants. 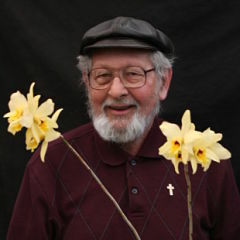 Through his friendship with the owners of the Santa Barbara Orchid Estate, he helped plan and managed their Summer Orchid Fairs during his years of retirement. Gene is survived by his wife Sandra, daughters Katrina Stone (Paul) and Stephanie Gonzalez (Saul), granddaughters Leanne Gonzalez and Sophia Stone, brothers Peter, Francis (Eileen) and Richard, sister Mary (Eric Cantlay), niece Maryann, nephew Kevin, and cousins John, Theresa and Margaret. His uncles Edgar Baum and Clyde Fell, aunt Luella Baum, and sister-in-law Elaine preceded him in death. A memorial mass will be held on July 31 at 11 am at St. Anthony’s Community Chapel, 2300 Garden Street, Santa Barbara, CA with entrance off Garden Street behind the Old Mission Santa Barbara. In lieu of flowers, donations may be made in his memory to the Cancer Center of Santa Barbara with Sansum Clinic, 540 West Pueblo Street, Santa Barbara, CA 93105 or to Sarah House, 2612 Modoc Road, Santa Barbara, CA 93105.